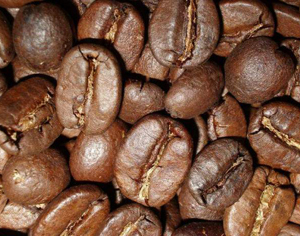 Coffee - a drink, which is prepared from roasted and milled grains, contained in the fruit of the coffee tree. This amazing evergreen plant belongs to the family Rubiaceae, in the wild it grows in North Africa, rather, Axum in Abyssinia or, because in ancient times it was called Ethiopia. 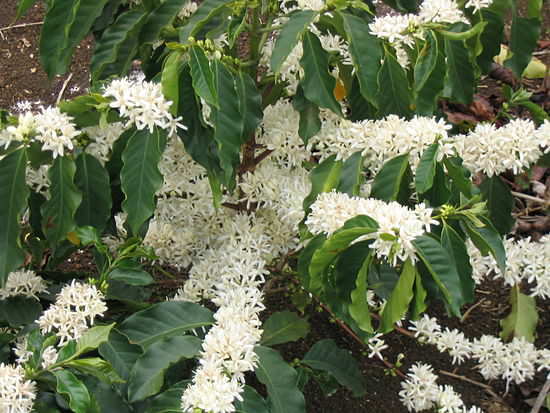 plant beautiful, with leathery leaves are dark green in color, white flowers, reminiscent of jasmine stars, and literally obleplivayut branches intact cascades. Coffee fruits sweet taste, They have a bright color: immature - green, ripen - yellow and ripe - bright red. inside berries, which is called "cherry", It is two grains. After the treatment, they will become the coffee, which we used to drink. 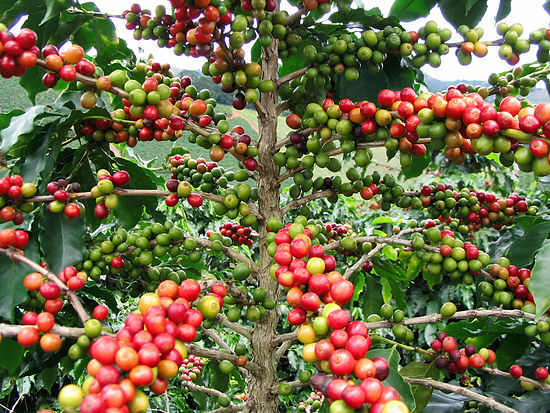 Cultivated mainly 2 species of coffee trees – Arabica and Robusta. Coffee is the most popular product in the world after oil, Judging by turnover. coffee production steps include: cultivation, fruit collection, their drying and cleaning, packaging of coffee beans raw jute bags in the special - are engaged coffee producing countries. A further roasting beans, compilation of varieties, crush, production of various types of coffee, the packaging of the finished product, usually, performed Consumer countries. they say, that the first fruits of coffee, like cherries, tasted sheep of a shepherd, which they pass in the thickets of stunted coffee trees. Sheep behaved strangely, instead become apathetic sporting and active, What surprised shepherd, and he, too, decided to eat these strange berries, and soon I felt a surge of energy after a tiring day. But the path to invigorating drink, to which we are all accustomed to, It was long enough. At the beginning, people just eat coffee berries, then began to brew the leaves as tea coffee, and the flesh of berries and dried corn was ground in a mortar, added some fat and did balls, who chewed for courage. Coffee berries are also still boil, even made wine from them, and only 15 century guessed, finally, fry grain, grind them and weld the resulting powder. It is believed, what use a powder of roast and ground coffee beans were first in Yemen, where else in the 4 century moved some Ethiopian tribes, taking with them coffee trees to be transplanted to a new location. So horrible coffee in Arabia, where the first plantations were imposed in the city Moho (Mokko). Year of creation of the modern version of the drink involve 1425 year. There is a legend, that one of coffee trees burned in the fire, and charred corn were very fragrant smell, they decided to grind and brew, and turned the famous and favorite drink - coffee. The Arab world is quickly assessed delicious and gives energy drink, coffee quickly spread, soon the market traders began to roast and sell coffee beans are amazing. In Turkey, at a faster pace began to spread first coffeehouse. AT 16 century talking about coffee in Europe. It was first mentioned in the scientific literature was made by the Italian physician Prosper Alpinus, who gave a detailed description of the coffee tree, and methods for preparing a beverage from its grains. At the beginning 17 century coffee brought to Europe from Turkey Venetian merchants. But the drink meets resistance, People are wary of it as some kind of a witch's brew, even require, that the Pope imposed a ban. But Pope Clement VIII, tasting coffee, I blessed him to eat. AT 1645 year there are the first coffee house in Italy, and soon in England. Coffee firmly and permanently seized the hearts of Europeans. In Russia, coffee appears 1665 year, it was prescribed as a cure for the king, a significant role played in the spread of coffee during the reign of Peter I, when coffee gained immense popularity in high society. Coffee plantations of Latin American countries - one of their main asset. Coffee is a traditional export item. Now, hard to imagine, that the coffee tree was brought here only at the beginning 18 century. Climate coffee trees went as well as possible, and soon, It started a real boom in coffee, to 19 century Brazil became the leading coffee producer in the world, preserving the primacy until today.